Over the years every generation has developed different ways of saying things. Do you talk your age? The vocabulary and slang you use can tell us a lot about you. Take this quick quiz and we’ll see if we can guess your age by analyzing the way you speak! When you meet someone new, what do you say? Choose a synonym for "wise". How do you describe someone who is attractive? What's your biggest grammar pet peeve? Which of these expressions do you like more? Choose an antonym for “sad”. Which 90’s phrase needs to make a comeback? Pick a word that sounds dirty, but isn’t. Which fancy word would you use to describe yourself? Which do you think is the best language to curse in? Which is your favorite idiom? Are you kidding? I don’t say any of these! Pick a slang word for "drunk". Which word makes you cringe the hardest? Which of these languages would you like to master the most? Can You Pass This Mandela Effect Memory Quiz? 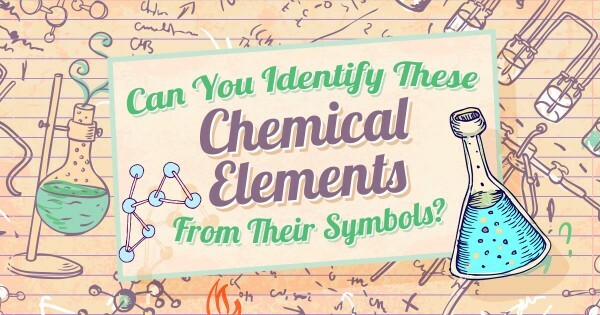 Can You Identify These Chemical Elements From Their Symbols?